Today, less than five weeks after the launch of Lumberyard, we are pleased to release Lumberyard Beta 1.1. This update includes 208 improvements, fixes and features; and is available for immediate download here. With Lumberyard Beta 1.1, we are releasing several significant workflow improvements, introducing mobile support, and extending the functionality of Twitch ChatPlay. The updates in this release are in addition to the new autoscaling features and region additions we announced for Amazon GameLift on March 10. Lumberyard Beta 1.1 includes three major new systems that directly accelerate your team’s workflows on the way to high-quality. Component Entity System – One of the areas we are focused on with Lumberyard is making the engine extensible by developers without changing engine code. Our new Component Entity system is built to enable easy engine extension with new components. Content creators can drag-and-drop and combine those components into new game objects. They can then make reusable assemblies of Component Entities, which we call “Slices.” Slices can be composed of other nested Slices. Slices can contain scene elements and game logic written in Flow Graph, Lua, or C++. Individual properties of Slices can be overridden, or shared among all copies of a Slice. This approach allows you to lay out generic copies of a Slice in a scene, and then quickly make changes to specific copies. For example, if you have a Slice that includes a row of street lamps, you could also include broken light bulbs on a select set of those street lamps. Furthermore, changes to the base model can quickly be shared with all copies. 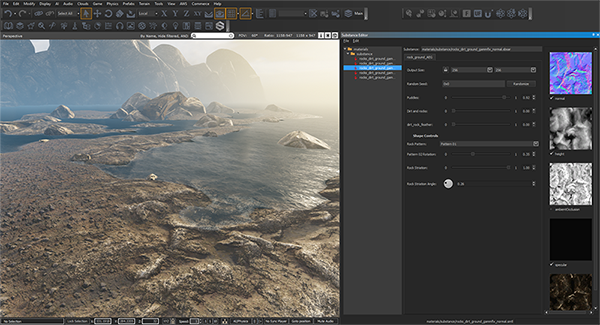 The Lumberyard Editor includes rapid drag-and-drop workflows for creating Components and Slices. Substance Integration – We are actively incorporating the most popular third-party packages into Lumberyard and we are excited to announce that Allegorithmic’s comprehensive texture and material authoring software, Substance, is now integrated with Lumberyard. Substance enables artists to procedurally create materials using a visual, node-based system, so they can build beautiful worlds faster than traditional hand-painted methods. You can use Lumberyard’s Substance Editor to import Substance files from Substance Designer, or generate and export static textures for materials. Additionally, you can use Lumberyard to modify Substance material properties in real-time. For example, you could use the Flow Graph to cause materials in your world to rust and age over time, or enable players to customize the world with new colors and textures. FBX Importer – Another workflow improvement we are previewing is a built-from-the-ground-up FBX Importer, which allows users to import 3D meshes and materials in a few simple steps. A new FBX Importer was one of the top requests from our developers who are using a variety of 3D authoring tools including Blender. Also, since many developers rely on their own proprietary asset formats (typically to support in-house tools or unique game features), we’ve built the FBX Importer to be extensible and support custom data formats. Six new Gems designed to help you get prototyping faster, including pre-built code and components for game cameras, movement, and game input. A preview of the Cloud Canvas Resource Manager, which enables your engineers to set up specific AWS resources and deployments for your game features right from within the Lumberyard Editor. And to make installation easier, we’ve introduced a new Lumberyard Installer, which automatically downloads the Lumberyard package, so you can get set up faster than by downloading a single large .zip file. We’ve also made the .zip version available for developers who prefer that format. Lumberyard Beta 1.1 introduces mobile support. In this release, we include support for iOS devices with an A8 or better processor and the Android-based Nvidia Shield. 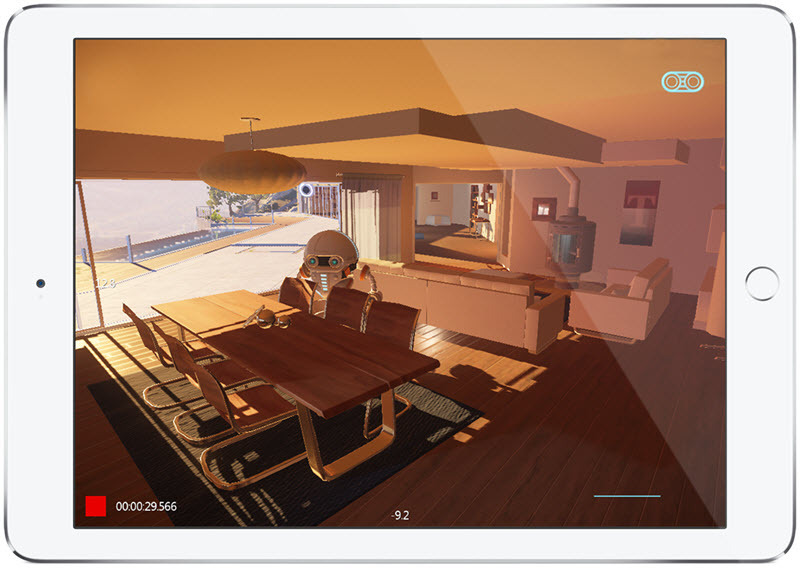 Lumberyard Beta 1.1 uses Apple’s Metal API and leverages their GMEM fast memory to enable you to create high-fidelity iOS visuals. By using Metal and GMEM, Lumberyard enables your game to directly access and push more data to the Apple GPU hardware, so your game can use the latest rendering techniques (e.g. post effects such as depth of field, glow, flares, and color grading). Supporting mobile developers building 3D and connected games is a priority for us and we will continue to expand device support in coming releases. Our customers have given us a number of suggestions for Twitch ChatPlay, which helps you build gameplay that interacts in real-time with Twitch viewers. Developers have told us that one of the most fun ways to engage fans on Twitch is by enabling viewers to vote on game modes and outcomes. To help developers create vote-based gameplay, we’ve added ChatPlay options that enable you to tally votes and query the results, so you can create more complex voting interactions. For example, you could ask your spectators to vote on who they think the best player was in a match, and then arm those players with different weapons in the inverse order of strength in the next match (so the worst player may end up with a nuclear plasma torpedo, versus the best player’s chicken bat). We thank the Lumberyard community for sending suggestions and feedback to our forums and lumberyard-feedback@amazon.com. The team loves hearing what you have to say about our tools and workflows. Keep it coming! And if you’re going to be at GDC, we have a Dev Day scheduled on Tuesday, March 15, so you can meet some of our team and dive deeper into our newest release. You can download Lumberyard Beta 1.1. here. For details on everything new in the Lumberyard Beta 1.1 release, check out the release notes here. We have a steady cadence of Lumberyard and Amazon GameLift updates coming soon, including more workflow improvements and ways to help you connect to AWS and Twitch. We’re excited to get your feedback – see you on the forums, or swing by our booth (Main Hall #1224) if you’re in town for GDC.